In what's pretty much a no-brainer, Grand Slam Tennis 2 will support the PlayStation Move peripheral. Gestures map as you'd expect and there's movement auto-assist if you're just playing with the Move wand. Your character will get there in time for you to plant your feed; all you need to worry about is aiming your swing. Using Move was fun but I kept getting distracted by my own body mechanics, which are not just that good, honestly. 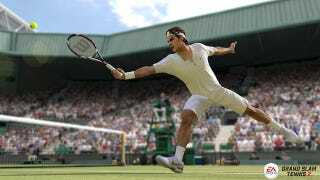 Total Racket Control and the chance to hoist tennis' biggest trophy at Wimbledon makes Grand Slam Tennis 2 one to watch when it hits next year.